Poffertjes are small, fluffy pancakes made with yeast and buckwheat flour. These tasty treats are prepared using a special pan with several shallow indentations in the bottom to hold the batter and make perfectly puffed small pancakes. 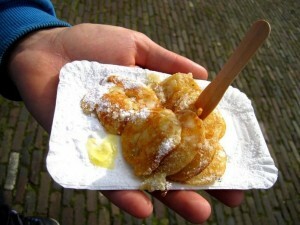 Poffertjesare typically served topped with powdered sugar and butter.